Today, I'm reviewing the romantic comedy, Holiday (1938), starring Cary Grant and Katharine Hepburn. 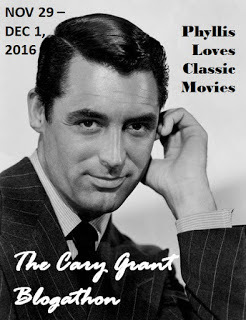 This article is part of The Cary Grant Blogathon hosted by Phyllis Loves Classic Movies. 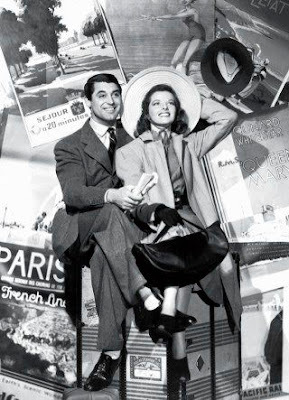 Cary Grant and Katharine Hepburn made four memorable movies together, but the 1938 romantic comedy Holiday is unique among their combined filmography. The movie came at a pivotal time in both actors' careers and, in several important ways, it set both of them on the path to becoming old Hollywood legends. Holiday tells the story of Johnny Case (Grant), a young New York City stockbroker who meets and quickly becomes engaged to the beautiful Julia Seton (Doris Nolan) while on a skiing vacation. What Johnny doesn't know is that Julia is from one of Manhattan's richest families, which includes her stern father (Henry Kolker), alcoholic brother (Lew Ayres), and free-spirited sister, Linda (Hepburn). Holiday, which is based on Philip Barry's Broadway play, had already been adapted by RKO Pictures for a 1930 movie starring Robert Ames and Ann Harding (incidentally, Edward Everett Horton played Johnny's professor friend in both movies). In 1938, RKO sold the script to Columbia Pictures, who wanted to capitalize on the runaway success of The Awful Truth (1937) by re-teaming Grant and Irene Dunne for a lavish remake. However, Columbia chief Harry Cohn didn't bargain on the force of nature that was Hepburn. The actress had recently bought out her contract at RKO after they offered her a terrible part in a B movie called Mother Carey's Chickens, and she desperately wanted to play the part of the independent and quirky Linda. In fact, Holiday was quite close to Hepburn's heart. She had been an understudy for the Broadway play, and her original screen test for RKO was a scene from Holiday. Hepburn and her old friend George Cukor, who directed Holiday, pleaded with Cohn until he finally gave in and cast her opposite Grant for their third film together. The result was a box-office disappointment that was praised by critics, but largely ignored by audiences. There's a lot of speculation as to the reasons for this, but it probably just boiled down to Hepburn's lack of box-office appeal -- her movies were popular in urban areas, but they usually sank like a stone in rural America -- and the fact that audiences during the Great Depression didn't have much patience with the problems of the idle rich. Johnny's decision to stop working so he could take a European vacation was a distant dream to many Americans who were struggling just to afford the 25 cent price of a movie ticket. Viewed today, Holiday is a sensitive and nuanced film about the love between two wounded people. The supporting cast is exceptional, especially Nolan, who does spoiled and rich well, and Ayres, as a lovable lush who drowns his daddy issues in a river of highballs. Hepburn gives what is probably her best dramatic performance of the late 1930s in a beautifully understated performance that critic Pauline Kael said "made ordinary heroines seem mushy." 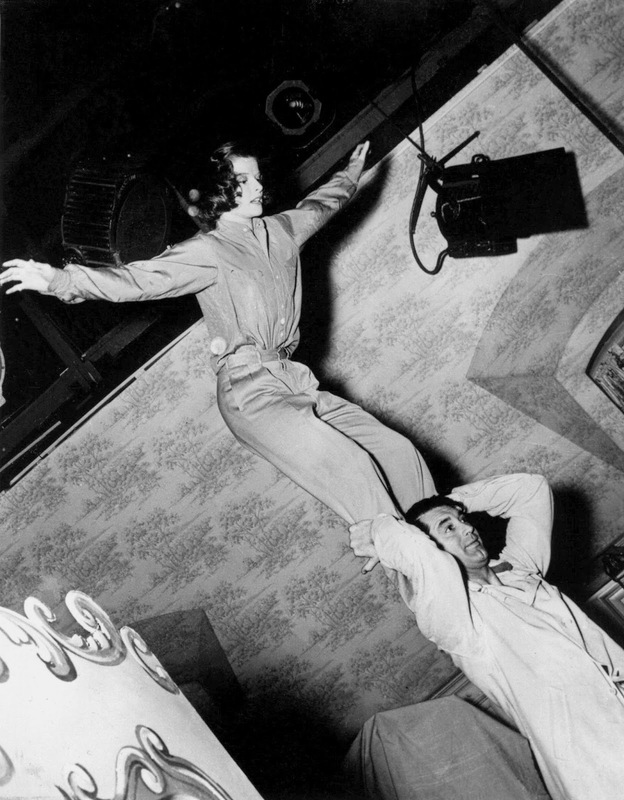 Katharine Hepburn and Cary Grant practice a stunt in Holiday (1938). Holiday was also an important stepping stone in both Grant and Hepburn's careers. Although there were many talents involved in making Holiday, Hepburn seemed to get all the blame for the movie's financial failure, and Holiday came to represent the nadir of her early Hollywood career. The indomitable actress would come roaring back two year later, in The Philadelphia Story (1940); in fact, The Philadelphia Story, which was written by Barry, directed by Cukor, and stars Grant and Hepburn in very similar roles -- C.K. Dexter Haven is an even more successful self-made man than Johnny Case and Tracy Lord is a pricklier version of Linda Seton -- can be viewed as a kind of sequel to Holiday. For Grant, Holiday solidified his status as one of old Hollywood's top leading men. He had already played several romantic love interests, but they were mostly in comedies like Bringing Up Baby (1938) and Topper (1937). Holiday, while still a romantic comedy, was a more serious role that gave Grant the chance to show off his dramatic range while also establishing the "Cary Grant" screen persona that would make him an old Hollywood icon. In Holiday, Grant looks effortlessly wonderful in a tuxedo (every female character in the movie mentions his looks). Also, while maintaining the puppyish charm of his early performances -- Grant does several goofy acrobatic tricks -- he also shows the first glimpses of the suave charmer that would appear in his celebrated roles like North by Northwest (1959). Holiday is available on DVD and video on demand. Enjoyed your look at this film which had such a good cast. Thanks. It was a great cast. For me it is one of Lew Ayres best performances ever. Your description of the wounded souls that are Linda and Johnny touched my heart. It is a sensitive film that you critiqued beautifully. Thank you. Neither Hepburn or Grant ever played vulnerable that much, but they do it beautifully here. I didn't know the role was intended for Dunne!! I'm sure she would have been wonderful but it would be a completely different movie. It's funny how Hepburn was poison but is now regarded as one of the best actresses ever. I never thought of The Philadelphia Story as being a sequel but it woulld certainly fit!! Thanks for participating in this Blogathon! !